Finally got a first crop of these and I'm stoked that it survived the past 2 winters and has set fruit. Yuzuquat is coming back strong as well. And my zombie Meyer lemon is speeding up from its resurrection. Yes. This one is Thomasville. I know some people complain about the taste, but it's very limeish tasting. I mixed some with rosemary simple syrup and some water, and my wife and her aunt didn't throw up The wife said that it tasted a wee bit unripe though. Congratulations! That's great. I wish mine would bloom. Oops that's a pic from June. It's bigger now. I need to take another pic. Citradia: How old is your tree? Mine is about 4 or 5 years old. Got it fro Stan Mckenzie in 2013. Mine has seen 3 winters here and I got it from Stan too, so about 4 years old I guess. It froze to the ground winter before last when I had at least two nights of zero degrees all night long and the five foot tall tree was only protected by a cage full of leaves covered in plastic and frost cloth; the swingle and rusk died completely with only leaves packed around them and covered in frost cloth. Thomasville came back from roots, and is my only original tree to survive the polar vortexes without electric heat. Thomasville needs cross pollination with other citrus to produce abundant seeds, although all the resulting seedlings are true of type. Thank you Ilya I guess cuttings it is. USDA has literature stating that it roots very easily, so I guess I'll try that. Here's a pic of my Thomasville yesterday. Although edible you won't be smiling when you taste them. In 2000 I bought a 3 gallon with fruit. any nursery would sell such a tree. Grafted it to satsuma so I could eat the fruit. It is not for the first time I read your opinion on Thomasville. I wonder if it could be due to the existence of different clones? Here in Europe we have a clone that does not have any poncirus off-taste and bitterness. When green it is acid like lemon, but in May when ripe it is approaching mandarin in taste. And it is definitely more hardy than satsumas. I basically use it for cooking and drinks. Unless I luck out, I doubt it will ever get to the ripe stage in 7B. Those of us below zone 8 have to take what we can get Stuff like Citrangequats and Ichang lemon are our best shots. 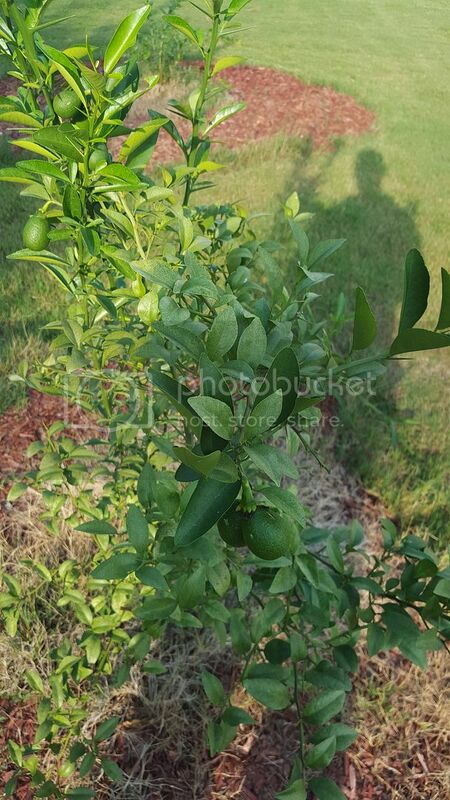 If you can get away with Meyer Lemons, I would definitely take that over a citrangequat, but since I'm half a zone away from in ground Meyers..
Is anyone willing to sell Thomasville seeds? I'd love to give some a try. I hear they are fairly quick to flower/fruit. Who said Thomasville has a bad flavour?